Discussion in 'Transformers Movie Discussion' started by CyberShadow, Aug 24, 2010. At the end of the first movie, Prime refers to Megatron as 'brother'. I have not read anything beyond the two movies, but is this just an expression? In early scripts for the first movie, Optimus and Megatron were the sons of Sentinel Prime. The backstory is parred down in the final film to them having been friends turned enemies. When writing the second film, Optimus was the sole descendant of the Primes, hidden away from The Fallen. When the Fallen says "Die like your brothers! ", those are presumably the children The Fallen killed when Optimus was an infant and hidden away. This too was left out of the final film. Clearly the writers understand people won't accept sexually reproducing robots despite the incredibly organic nature of the Baysformers, who moreso than any other Transformer come across as silicon-based lifeforms, people made of metal and energon instead of flesh and blood to be exact. Excellent answer, Alienbot. I learned something new today. It is never said that the Twins shared parents. I personally always assumed they had just been the same protoform that ended up with two sparks somehow. And I know a lot of people just brushed off much of what Jetfire was saying at that time as being the senile ramblings of an old man/jokes. I mean, do you really think that his father was the first wheel that didn't transform at all? If what you say is true Alienbot, can Optimus Prime kill Megatron? after all, you can't go against family and it might be hard for Optimus to kill someone he's related to. And Jetfire has issues with his mother. The whole hatchling bit inside the Nemesis suggest native Cybertronians aren't built. Heck Optimus Prime is the last descendant of the Primes. Prime himself said whole generations were lost to the war. My point is, when working on TF1 the writers worked from the assumption Optimus and Megatron were brothers, and on ROTF they didn't, so that's why Optimus trashtalks Megatron in the forest rather than being "Nooo Sam, push the Cube into my chest [so Megatron will come to his senses and end the war after losing me and his prize]." For now, as reflected from the change in the tie-in fiction, they're allies-turned-enemies. So really, I don't have an opinion, but food for thought. And maybe I should have written "believe" instead of "understand", but honestly, the general audience is still going to find robot families weird. If Megatron had said "I consumed the spark of our father and I'll consume your's too!" in TF1, they would have been more accepting of something more clarifying like The Fallen saying "I'll finish you off like all my nephews and nieces! ", but they didn't so it didn't happen. 1-I missed the mother thing. What was it? 2-It suggests that they are grown, yes, but there is never a sexual reproduction seen or discussed. Unless Megatron and Starscream were getting it on off screen. 3-That is a plot hole because it is never explained how that could work. Is it a sexual reproduction? Asexual? 4-Again, never explicitly explained in what terms. We are on the fourth generation of iPhone but I don't think Steve Jobs is getting it on with a computer...OK, well I do, but I don't think they are making iPhones that way. Perhaps a group of hatchlings is called a "generation" as they are all born at the same time? In either case, it does not implicitly state (nor imply) sexual reproduction. In the first movie Ironhide complains the humans being primitive and violent Prime answers "Were we so different? They are a young species...". Now this suggest evolution on Cybertron. They didn't need the Allspark to reproduce per se just provide an Energon source. 1.) Prime intended to use the Allspark to repower Cybertron as it was intended. Megatron wants to abuse it by creating Transformers directly, which makes souless, primal Transformers. What separates Cybertronians from Allspark mutations is that Cybertronians have sparks. As seen with Prime, Megatron, Jetfire and the Fallen. Now the presence of the Arcee trio confirms yes Transformers do have genders. But do they sexually reproduce like us humans? Not necessarily because sexual reproduction in nature does mean usually enter Tab A to Slot B. Now this suggest evolution on Cybertron. What? How? It suggests that Prime regrets loosing almost his entire sepcies in a war and that they have been around a lot longer. That would indicate, rather, that they didn't evolve. And evolution does not need parentage. If they did evolve, it could have been through better technology or any other reason. They didn't need the Allspark to reproduce per se just provide an Energon source. This came out in ROTF, but we still don't see reproduction. We didn't see the hatchlings be made, just in their little sacks. One plot hole covering up another. How did those TFs get their sparks then? He's called Megatron, right? So he can't be Optimus his brother, else he would've been called Megatron Prime, since Prime's are born. And Megatron is not a Prime, else The Fallen wouldn't have teamed up with him. I'm getting tired of this discussion, to be honest. Why are there still people who just can't seem to understand it? They don't have to be biological brothers, however that works, but they could have once been part of a close family. They plug their flash drive into another robot's flashport and share the information. Remember the prologue in the first movie. They don't know the origin of the Allspark only that it has the power to create worlds and fill them with life. Life created with ordinary machinery shows that they feral in nature without sentience. Now compare them to Cybertronians that have been around a lot longer. Jetfire cites his ancestors have been on Earth for thousand of years looking for the Matrix. 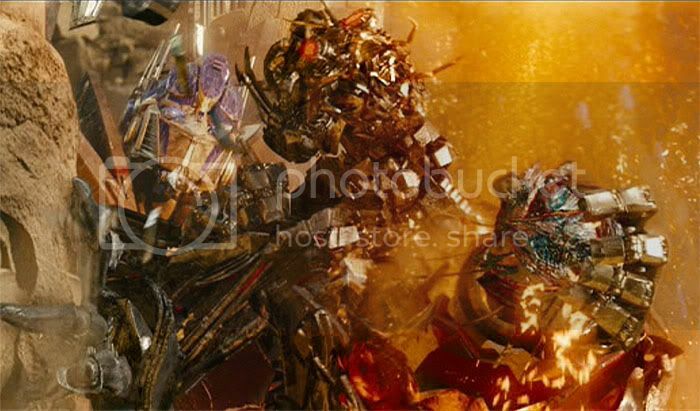 As Orci said the Allspark on Cybertron wasn't used to birth Transformers but power Cybertron. Meaning sustain Cybertron's environment. Course we find out in ROTF even the Allspark's ability to produce Energon is finite hence the Primes expeditions to harvest stars. Energon is said by Jetfire as the lifeblood of the Transformers. Without it they'll die. Sparks from the looks of it seems to be balls of Energon. Like I said in another thread Transformers may create life with Energon rather than DNA. From Jetfire's rant about his mum and dad Transformers do have families. Now this is in the dialogue. The thing he was forgetting due to Energon deprivation is that why was on Earth in the first place. Add to that Optimus Prime called by the Primes as their last descendant. Now Megatron and the Decepticons doesn't mind cloning or outright sparkless drones just to build an army. As for the original topic. The original background was rewritten as to Optimus and Megatron being brothers in arms. According to the Hasbro Transformer glossary Megatron was the Lord Protector of Cybertron. Since Prime in this continuity means royalty basically their relationship could like that of a Shogun and the Emperor. Optimus did call Cybertron an empire. What was the dialogue? I don't remember Jetfire mentioning anything about HIS ancestors...not again does this support a sexual reproduction. Did they ever actually say, in the movie, they were going to replenish the Allspark? I mean, I know in the adaptations/extended fiction it was explained, but in the final product we don't know WHY they are searching for more Energon. They sure do, don't they? So then why wouldn't the mutations get sparks if they are being birthed by the Allspark? Never explained. This is your own conjecture and, while very neat, is not cannon. And you still haven't told me where this mention about his mom is. And again, it is hard to take that aspect seriously when he cites his father as being the "first wheel" which transformed into "nothing" but did it with honor. Yeah, that seems like ramblings of an old man done for humor and maybe character as it emphasizes him as an older, forgetful character. Which is never explained how that works! Again, logical if Orci's statements can be taken as cannon. But it doesn't address means of repoduction. But is WFC being reincorperated into the movie line? I'm a little unclear on how this is all working now. And look, I want to be clear. I think you could very well be right, but we don't know because of all the plot holes these movies presented us. Its so annoying because so much could have been fixed so easily. In a bit of theistic evolution, may I suggest the Transformers evolved from the energon radiation that liquified and pooled around the Cube? And what RedWolf means by background is IDW Publishing, don't confuse it with WFC/Exodus. And you still haven't told me where this mention about his mom is. It means you didn't really listen during ROTF. Jetfire: What do you want? Sam Witwicky: Look, we just want to talk! Jetfire: I've got no time to talk, I'm on a mission! I'm a mercenary doom-bringer!... What planet am I on? Jetfire: I have issues of my own, and it started with my mother! My ancestors have been here for centuries! My father, why, he was a wheel! The FIRST wheel! Do you know what he transformed into? Jetfire: NOTHING! But he did so with honour! DIGNITY, damn it!